I'm Chuck Willis, owner of Running Bare Natural Hoofcare. My family and I share our lives with horses, and I've had the opportunity to see our own equine friends move through health, disability, and the happy transition to barefoot. As a horse owner, natural hoofcare practitioner, and a Native American, my personal belief is that the Creator designed the hoof in a perfect way--to flex, expand, and adapt to the environment in which horses live. I live, ride, and care for horses near Mount Hood in Oregon. My goal is to bring the knowledge I have gained through the study of the wild horse, as well as my training with the Association for the Advancement of Natural Horse care Practices (AANHCP), continuing education and research with noted hoof care professionals and researchers such as Pete Ramey and Dr. Robert Bowker, DVM, and most importantly, my practical experience, to as many horses and horse owners as possible. While I am no longer a member of the AANHCP for personal reasons, I did receive my training through this organization and Certification in 2009. I have been trimming professionally since 2005. Learn more about me and my Practice in About Us. YOU MAY ASK: WHAT EXACTLY IS NATURAL HOOF CARE? True natural hoof care is the wild horse moving about on all types of terrain, naturally trimming its own feet. Using the wild horse as our model, natural hoofcare practitioners shape horses' feet to provide optimum support and circulation without the application of metal or synthetic shoes. Hoof boots may be used for transitioning or extreme conditions. This growing practice is endorsed by all types of riders, from endurance, show, and pleasure riders to municipal mounted police departments. Learn all about it in What Is Natural Hoof Care? I hear this almost daily from owners who have been told this by trainers, farriers, or veterinarians or from owners who simply shoe horses because they think they have to. 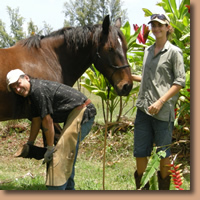 I explain that the natural trim is different than the traditional farrier, or pasture trim. Those types of trims can actually restrict proper growth and circulation, which are needed to build strong, gravel crushing hooves. Due to my personal experience in taking my own horses with problem feet barefoot, working on countless others, and using hoof boots when needed, so far, I have not found a horse that cannot go barefoot!! 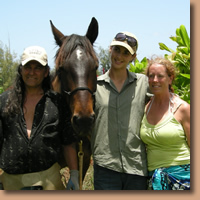 Read more about my family horses' transitions in About Us. 5. How often are trims needed? This depends on the individual horse's activity level and terrain on which it is kept, but the average is 4 to 6 weeks. Sometimes, it can be 3 to 4 week intervals in the beginning to get the hoof on the proper growth pattern, then stretching out to 5 or 6 weeks as it becomes healthier and stronger. 4. How much does natural hoof care cost versus regular farrier trims and shoes? The cost of natural hoof care is comparable to or slightly more than regular pasture trimming, but can be less expensive than shoeing, depending on the horse's individual condition and issues. Because we advocate regular hoof care on a schedule of 4-6 wks, it can be comparable in cost, to some standards of resetting shoes every 8-10 wks. Although, for the health of your horses’ hooves, joint function, and weight distribution on soft tissues, even the Farrier’s Journal has reported that the recommended length of time between trims and resets should be 4-5 weeks. The Houston Police Department actually saved the City of Houston $50,000 in a year by going to barefoot natural hoof care. To see more on the Houston Mounted Police click here. 3. How are professionals trained? Nationally, as well as internationally, the Association for the Advancement of Natural Horse Care Practices (AANHCP) regulates an education and certification program. There are additional state or local groups as well. 2. Who "invented" natural hoof care? The Pioneer of natural hoof care is Jaime Jackson, author of "Horse Owner's Guide to Natural Hoof Care”, through his research and study of the wild horse since the 1980’s. Pete Ramey’s (author of "Making Natural Hoof Care Work for You") research and clinics have also been instrumental in bringing this information to the public. 1. Can every horse go barefoot? That is the big question. It is my belief that all horses can, but not all owners. The single most important successful step that I have found, in addressing this question, is the education of the horse owner on the development and function of the hoof. The reason is that in some cases, it can require diligence on the horse owners’ part with changes in feed, environment, the possible application of hoof boots, soaking, exercise, etc. on a regular basis. A natural hoof care professional will work with owners to determine a horse's candidacy for the barefoot life as to what will be needed to create the healthiest hooves possible. This is the “Beginning of a Hoof Care Partnership” between you, your veterinarian, and your farrier. If you, as a horse owner, are serious about helping your horse to have a long and healthy life, with prevention as the key to avoiding (or healing) problems such as navicular, founder, etc. then natural, barefoot hoof care is an option you will want to consider!